In this article I go through how we transformed this pine kitchen into a hand painted kitchen matches Miele units Wilmslow Cheshire. This enquiry came through David’s neighbour whose kitchen we had painted a few weeks earlier the Limed Oak one in Wilmslow. 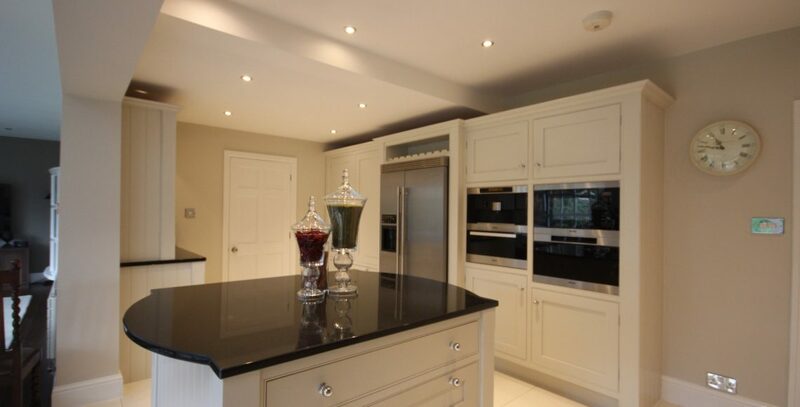 They’d seen what a hand painted kitchen should look like and were suitably impressed, so I was invited to quote up their kitchen and give them any ideas I had. David had a couple of new units fitted by Miele which was a shade of white and very modern a year before. Furniture painter Russ Pike: A traditional painter. A specialist decorator. Based in Nottingham. For over 30 years, Russ has developed a reputation for working to the highest of standards. Quality is certainly guaranteed when it comes to hand painted kitchens & furniture, period properties and prestigious private homes. Martin & Bernice had their Walnut kitchen now hand painted, this was built for them years ago. It was very well made and showed small signs of wear & tear. The only down side of the kitchen itself was the colour, it was just too dark and needed to be lightened up. Miele kitchen Alderley Edge Cheshire: Leigh had contacted me via the Internet whether it was possible to paint her Miele kitchen Alderley Edge Cheshire. Her sister had a kitchen that a good friend of mine Russ Pike had painted. I haven’t come across one yet that we couldn’t do anything with. Leigh’s kitchen was a very well made one and far to good to replace. Being Miele it would of been expensive to begin with and full of Miele appliances.